Below you see centering. 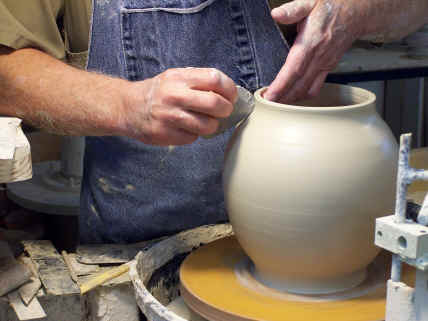 The right elbow is blocked firmly against the deadrest and the left hand drives the clay downward allowing virtually any mass of clay to be centered easily and quickly. This is the first pull. 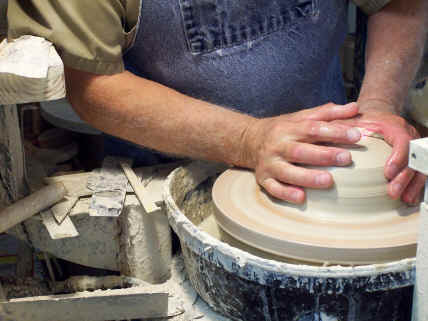 The elbow is pinned to the deadrest by the body so that it acts like the tip of a compass, assuring the right hand stays accurately positioned with respect to the center of the pot (no wobble at all). Below is the second pull. 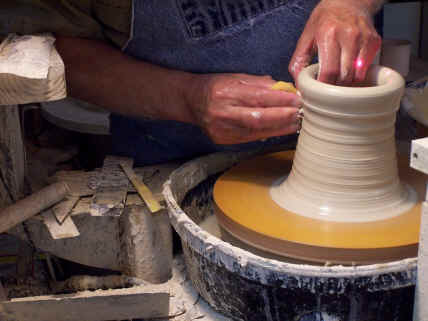 The stability resulting from the pinned elbow makes the creation of the blank form (cylinder) very fast because the outside hand requires much less attention since it is mechanically restrained with respect to the pot’s center. Finishing thin rims is much easier when you have a place to rest your elbow too. The deadrest can be moved up or down, left or right and forward or backward to position it for maximum versatility. 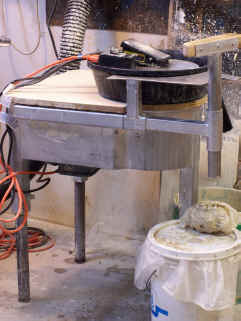 Additional deadrests can be added to the wheel in other locations to assist other forming steps and trimming. Banding and other types of decoration are easier too. Call me at 1-208-746-3724 if you want to talk about this piece of equipment. 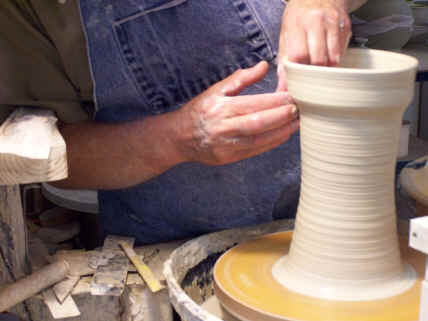 Below are three wheels that allow standing while throwing. 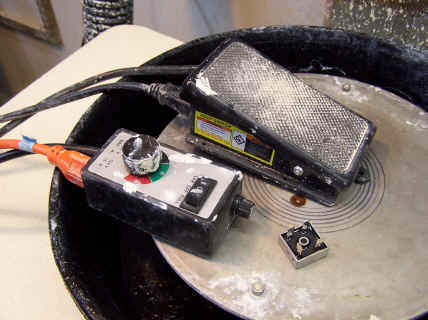 The first wheel is a Shimpo lite. 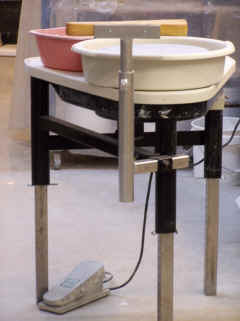 The user stands so that the right elbow touches the deadrest on the right side of the photo. This makes the flat table area to the left the ideal spot to put a water bucket and tools. Because it is so light weight and tall, this is by far the least stable of the three wheels and so requires that it be lagged to a wall to avoid tipping away during centering and throwing if at full height. The second wheel is a Pacifica GT 400 modified for standing and equipped with an articulated dead rest designed to fit virtually anyone. 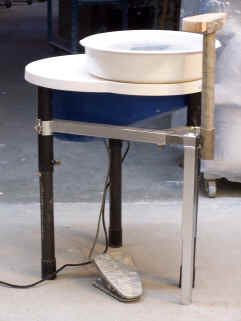 Adding the welded tube to the Pacifica legs gives us a place to attach the dead rest and makes the wheel rock solid while turning the work table into a convenient work surface for water bucket and tools. 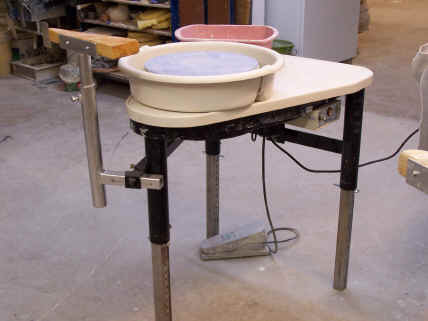 If the round tube legs were replaced with square tubing legs the same size as the brace tube and a second brace were added to the other side, the wheel could be used standing on either side for people who like to throw clockwise. The legs use cross bolts through accurately drilled holes to assure absolute support at all times. A locking bolt then secures the legs inside the tube to prevent wobble.